Imagine finding out one random, normal day that everything you thought to be true – about your life – was a lie. For Clary Fray this is reality and not one she’ll willingly admit to. 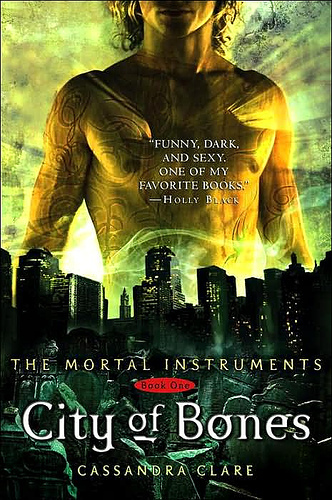 Being witness to a vicious crime no one else could see, begins a spiral of events that crack open locked memories as Clary searches for her mother and finds herself immersed in a battle reawakened by the presence of a madman. Clare immediately draws readers into a familiar, yet altered, version of the known world captivating the senses in a seamless narrative. The balance of descriptive prose and dialogue make it seem as though you are experiencing these events right along with Clary. Even during the quieter moments there is a sense of anticipation and wonder that keeps interest peaked and heartbeats thumping. What I love best about this story is that in the midst of the fantastic, ordinary moments of friendship, bonding, heartbreak, and love ring true. These elements ground Clare’s dramatic tale making it feel that much more feasible and realistic. It is rare to be able to lose yourself so completely in a novel and trust the storyteller to reveal everything at just the right time. Clare makes palpable the idea that the scars we bare in this life do not just come from others and remain visible on the surface, but lie deep and may yet bleed. Review by M.J. Moores, OCT. Author. Editor. Freelance Writer.